I’ve been swamped with editing work lately, so the girls haven’t gotten much play time. On Sunday, I took them to the dog park for some much-needed energy release. When we got to the park, it was occupied. Normally that’s a good thing; the girls love nothing better than a romp with doggie friends. On Sunday, the occupants were: one elderly dog, one woman, and three very young, energetic children. The park rules (posted on the entrance gate) clearly state that no children under the age of 12 are allowed. This rule is in place to protect the children. And it is, after all, a dog park. Cleo is scared of kids. If I let her in, she’d sneak past them and run to the far end of the park. Libby on the other hand, loves kids. I didn’t want her to jump on the children to give them kisses. I asked the woman to have her kids sit quietly at the picnic table. The plan was to keep Libby on her leash so I could control her greeting. The minute the gate was open, Libby took off. I’m not quite sure what happened next, but somehow my end of the leash (attached to my hand) didn’t make it through the gate. 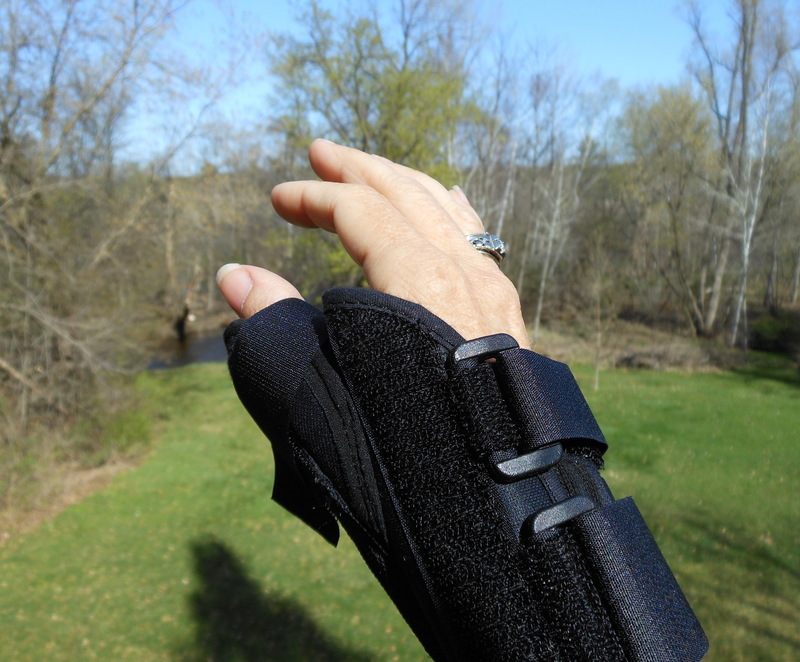 So this is my fashion statement for the next four to six weeks. Unless I need surgery, that is. The ER doctor says I sprained and partially dislocated my right thumb. The orthopedic surgeon will review the x-rays next week. Luckily, I’m left-handed, but it is still remarkable just how much we do with our non-dominant hands. So I’m taking suggestions for dishes that can be made with one hand. 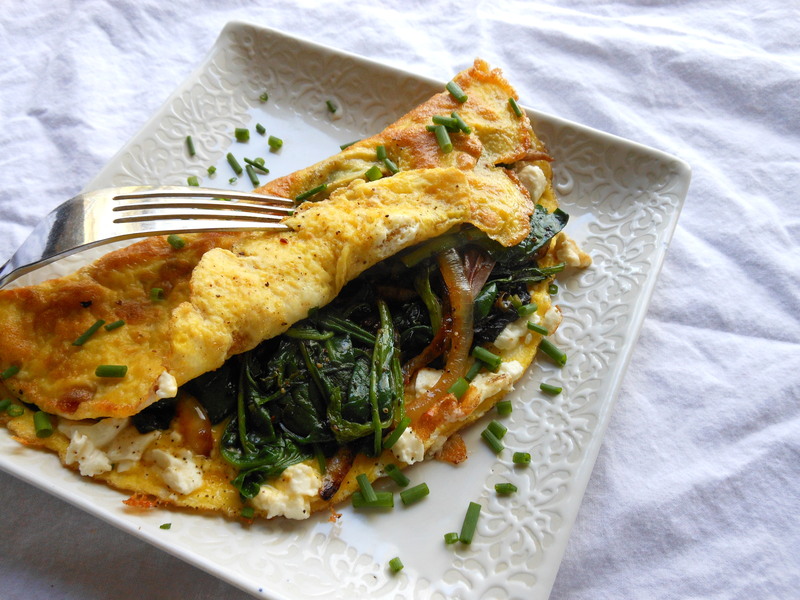 Today’s lunch was an omelet stuffed with sautéed onions and greens, with some crumbled feta. Chopping is difficult right now, but I found I could slice an onion and toss it into a skillet. Once they were golden, I tossed in a few handfuls of salad greens: baby spinach, arugula, radicchio, and leaf lettuce. (Yes, you can cook lettuce.) Feta cheese adds a salty tang. (It would also be fabulous with black olives and homemade ricotta instead of the feta.) It was a perfect lunch: light, healthy, colorful, and satisfying. Beat the eggs with 1 tsp. water in a small bowl; set aside. Melt half the butter in a small skillet over medium heat. Add the onion and Aleppo (if using), and cook until the onion is golden. Rinse the greens lightly and add them to the pan, with just the water clinging to the leaves. Add the black pepper. Cook, stirring, for 1 to 2 minutes until just wilted. Scrape the filling out of the pan and set aside. Return the pan to the heat and add the rest of the butter. When it’s melted, pour in the eggs. Let them cook undisturbed for a minute. Add the greens to one half of the omelet. Top with the feta. 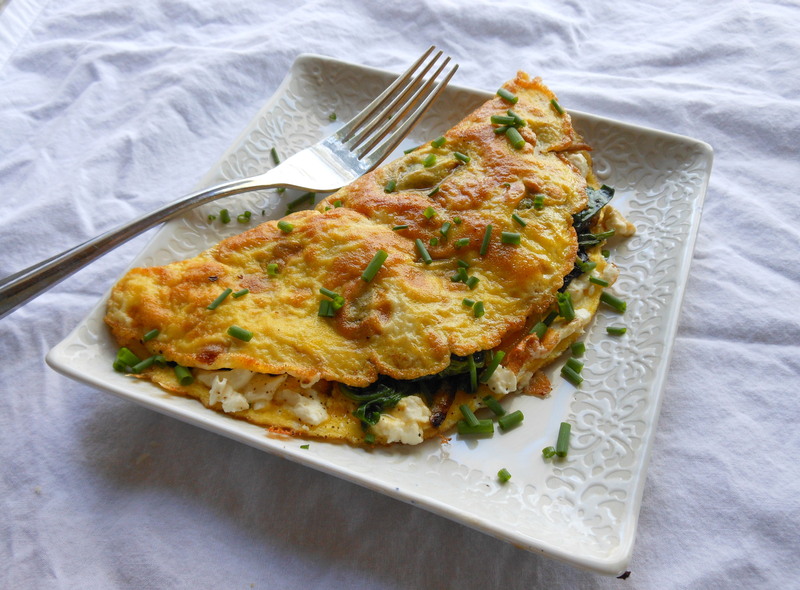 As soon as the eggs are fully cooked, flip the plain side over the filling, top with chives, and serve. The whole egg-cooking process should only take a few minutes. This entry was posted in main courses, veggies and tagged arugula, cheese, egg, eggs, fast, feta, greens, healthy, lettuce, omelets, spinach. Bookmark the permalink.